For many years, Hofner provided a service to customers that most other guitar manufacturers would never dream of doing........they sold the timber, parts, and even finishing materials that enabled amateur luthiers (and perhaps even professional ones) to make their own guitars. One's first impression is that doing this would be commercial suicide. Why pay for a complete guitar that had been made within Hofner's workshops when one could buy all the parts necessary to make one's own at a substantial saving in cost? However, maybe things are not quite as simple as that! 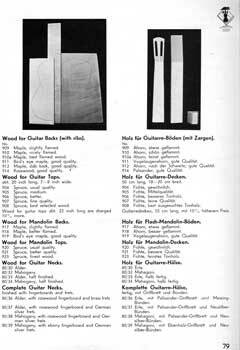 If one studies a pre-WWII Hofner catalogue, it is evident that a considerable proportion of this publication is taken up with pages full of ready-cut pieces of tonewood, lacquers, partially completed and completed (but un-finished) bodies and necks, and items of hardware for all types of stringed instruments including orchestral and guitars. 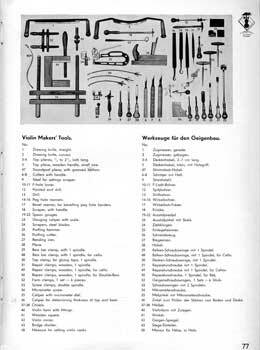 Even work tools such as chisels, hammers, drills, scrapers, and gouges are all in there. 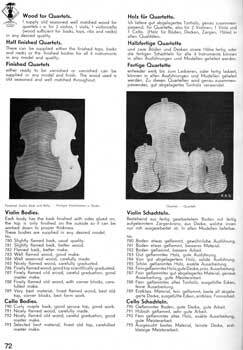 The 1937 Hofner catalogue comprises of a total of 88 pages, of which 19 pages are devoted to selling such items. A clue to why this should be may lie in the fact that Hofner, in common with other Schoenbach manufacturers back in those days, used a very large number of sub-contract homeworkers to make such items as guitar necks and even complete bodies at their homes. Those workers would pick up timber blanks from the Hofner factory, take them home, and then return to Hofner a few weeks later with a batch of completed instrument components which would then be assembled into a complete instrument by luthiers working within Hofner's own workshop. This practice continued to a lesser extent after the war when the Hofner family together with many other refugees from the Sudetenland had become re-established first in Moehrendorf and then in Bubenreuth. So, established procedures for dealing with the various raw materials and components were already in place, and it was really only one further step to offering these on direct sale to members of the public who wished to make their own instruments. 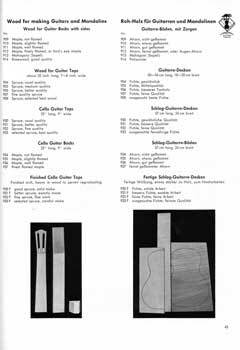 In the first general catalogue that Hofner published after the war, in 1950, this practice of offering parts was re-commenced, with such items as guitar fingerboards, bridges, wood inlay strips for binding and purfling, fret wire, and nuts, etc. As well as partially completed orchestral instrument bodies and necks, spruce tone-wood pieces (20" long x 7 to 8" wide) were also on offer. The quality of this timber was graded from "usual quality" up to "best selected wood". 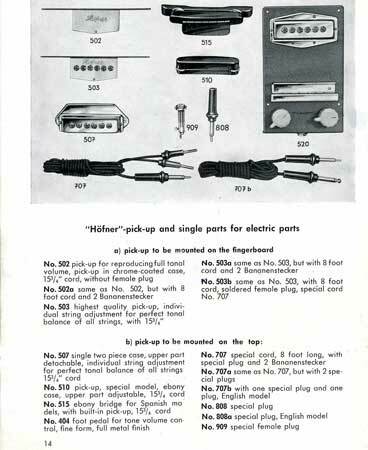 By 1955, Hofner had begun publishing a catalogue specifically for guitars, but in this the only parts being advertised were electrical items such as pickups and cable leads. This reflected the increasing interest by many players at the time in the amplification of their previously acoustic guitars. 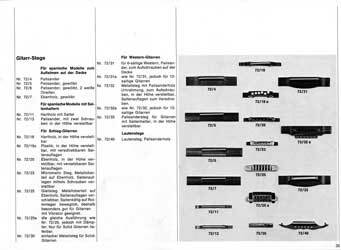 In the 1950's and 60's general product catalogues however, a full range of parts including guitar necks, guitar body tops and backs, tonewood, and tools were all there on offer, just as back in the pre-war days at Schoenbach. In later years, Hofner also began making comprehensive kits of parts for enthusiasts to make up Hofner guitar models such as the 500/1 Violin Bass, the Shorty travel guitar, and also a classical guitar. 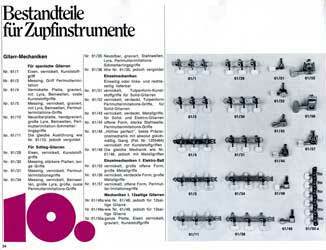 In 1971, Hofner produced what was probably their most comprehensive-ever guitar catalogue. This ran to over 50 pages and was purely devoted to what was by then their large range of guitar models. 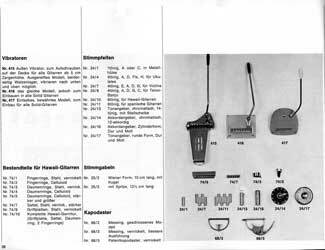 A full range of spare parts were also displayed in this catalogue, including tailpieces, bridges, pickguards, as well as the usual selection of electrical components as had been featured in previous catalogues. 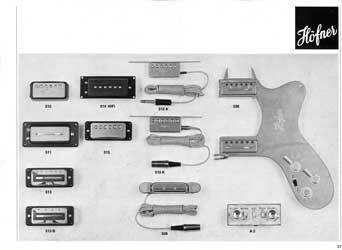 The emphasis of the type products on offer however points to them being considered more as spare/replacement parts and not specifically for the making of guitars. 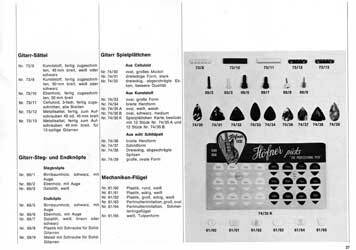 Guitar Spares in the 1971 Hofner Guitar Catalogue. 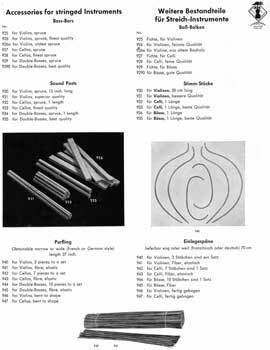 The days of Hofner supplying luthiers with guitar-making materials were not over in 1971 though. 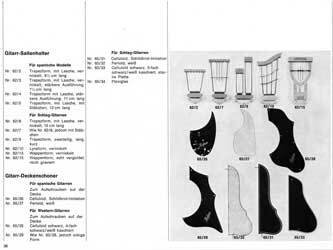 Hofner continued to publish their General Instruments catalogue well into the 1980's, still with pages dedicated to tone-wood and partially completed instrument bodies and necks. 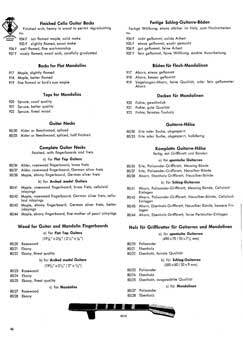 As late as 1995, kits of parts for making up violins and violas together with a selection of varnish were still in Hofner's price list. However, with the taking over of the company by Boosey & Hawkes in 1994, changes were inevitable and finally the supply of luthiers' parts and materials ended. Hofner had become a conventional instrument manufacturer. 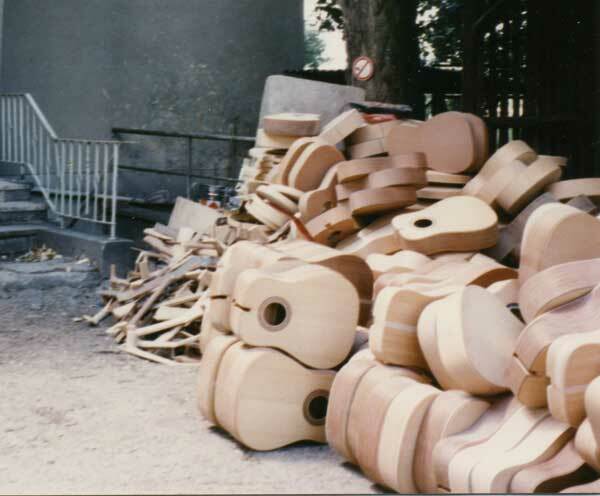 As a post-script to the above, when Hofner moved out of the old Bubenreuth workshops in 1997, a considerable stock of guitar bodies, necks, and general guitar hardware still remained in the workshops. Much of this was sold off to dealers, luthiers, and other interested parties, with perhaps the majority being purchased by the Music Ground company who at the time were based in Doncaster, England. Many a new guitar has by now been made up from those salvaged parts. The writer can recall visiting Music Ground back in the late 1990's and being shown into a large storeroom behind the shop which was full of partially completed Hofner guitar bodies and necks awaiting customers. This was surely the end of the above story.